"Cheating may be endemic in our nation’s schools, but parents have the power to reverse this trend, one family at a time." I’ve had cheating on the brain this week because I’ve been researching an article about creating cheating-free classrooms. A few friends asked me to write about how parents can best address the topic of academic dishonesty with children. Whatever the reason, cheating ramps up during middle school, where just over 60% of students reported cheating on exams and 90% admitted to copying another students’ homework, and peaks during high school, where about 75% of students admit to having committed acts of academic dishonesty. Researchers in another study found that almost half of all students have committed “cut-and-paste plagiarism,” lifting text from websites and passing it off as their own work. What I find most disturbing, as a teacher and as a writer, is that more than 75% of undergraduate students believe that copying off the Internet, whether through for-profit essay websites or cutting and pasting snippets of text, is not a serious offense. In fact, as I was researching this piece, I discovered one of my own published articles for sale at a popular essay retail outfit (and to add insult to injury, I was on sale for just $10 a page). Despite these statistics, 34% of parents don’t talk to their kids about cheating because they don’t believe their children would cheat. It would be lovely if those 34 percent of parents who don’t believe their children would cheat happen to overlap with the parents of those 30 percent of undergraduates who are not cheating, but I hardly think so. First and foremost, talk about academic dishonesty. Place that elephant right in the middle of the room and describe it. Don’t assume your child understands the difference between collaborating and cheating, paraphrasing and plagiarism. Brush up on the definition of plagiarism and the reason we give others credit for their work. Discuss the realities of cheating: Academic dishonesty can destroy her reputation as an honorable person, not to mention her relationships with teachers. Next, get to the root of the reasons behind the cheating. Find out why she is cheating. Does she not understand the material? Has she asked her teacher to clarify? Talk to her teacher about your concerns, and find out if her teacher has any insights into the cheating, whether it’s to gain a leg up on her peers or to get around having to ask for help. In my experience, the most common parental response to an accusation of student cheating is denial, so teachers will find this line of inquiry refreshing. It will also go a long way toward reinforcing the partnership between you and your child’s teacher. Frame your conversation around school in terms of individual effort and personal goals rather than grades and test scores, as competition fuels academic dishonesty. Dissuade your child from comparing grades with her friends, and teach her that learning is not a means to an end, but the end itself. Speaking of friends, if you discover your child talking or texting with friends during homework time, ask whether or not her teacher has given students permission to work together on assignments. If she’s not sure, talk to the teacher about her guidelines regarding collaboration and homework. Think about your own involvement in your child’s academics. Do you help your child with homework? One in five adults admits that he has completed part of his child’s homework assignment. Worse, adults that do this believe that helping their kids with homework is fair. This is your child’s education, not yours; let your child discover her own answers and keep your participation in her homework to a bare minimum. If your child has not been caught cheating (yet), remind her that even when she gets away with it, dishonesty undermines her future success. If she’s cheating, she isn’t really learning the material, and she will be behind when the next unit begins. In courses such as math or science, where one concept or skill builds toward the next, students can get so far behind they are unable to recover. If it is a choice between cheating and a lower grade — take the D. I tried to convince them that they would rather face my short-lived disappointment with a poor grade rather than my devastation, humiliation and sadness at my failures in parenting and their faulty moral compass. I let them know that far from going to bat for them, if they were found to be cheating, I would let them burn in the fires of both their school’s and our home’s disciplinary hell. Cheating is only a failure if there is no lesson learned in its commission, and it is our job to help our kids locate that lesson amid the embarrassment and reprisal. An episode of plagiarizing on a high school science report will result in a zero and detention today, but later, out in the professional world, that plagiarism can spell the end of a career. Cheating may be endemic in our nation’s schools, but parents have the power to reverse this trend, one family at a time. 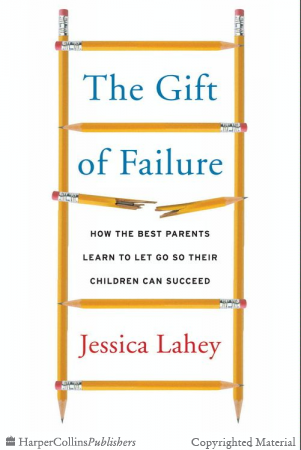 Jessica Lahey is an educator, writer and speaker and the author of “The Gift of Failure: How the Best Parents Learn to Let Go So Their Children Can Succeed.” Find her at JessicaLahey.com.